IT WAS CERTAINLY an odd marriage. The groom, already a well-known Irish poet, was fifty-two, the bride twenty-four. The groom had proposed to two other women immediately before settling for the bride, a well-bred young Englishwoman whom he had known for several years and with whom he shared occult interests. The bride was distraught when, on the honeymoon, her new husband turned gloomy with regret. She then decided to “fake” (her word, later repented of) sessions of automatic writing that would distract her melancholy companion. For five years—while the marriage was becoming solidly confirmed by daily life—the automatic writing continued, eventually yielding four thousand pages of script, until the exhausted wife called a halt. After at least two miscarriages, the union produced two children, and it endured as a cooperative endeavor throughout an unrelentingly busy joint life. In the poet’s declining years, he engaged in late affairs and friendships with well-off women living on comfortable estates, affairs known about and condoned by his wife, who now appreciated help in taking care of her increasingly fragile and increasingly famous spouse. When he died at seventy-three of congestive heart failure, his wife and his last lover were at the bedside. That is the quarter-century union made visible by the scores of letters exchanged between William Butler Yeats and his wife George (reduced from the hated “Georgie”), letters that enlarge our sense of the poet’s life in part by enlarging our sense of George. In 1939, directly after Yeats’s death, Auden wrote an elegy that perplexed me when I first read it as a girl. What did the younger poet mean by saying to the great Yeats, “You were silly like us”? What did he mean by that curiously ecclesiastical allusion to “the parish of rich women”? As time went on, biographies of Yeats became more candid, and Richard Ellmann’s The Identity of Yeats (1964) and Yeats: The Man and the Masks (1979) presented accurate information, much of it transmitted by George herself, about Yeats’s trafficking with the occult, and about his late-life associations with various “rich women,” from the lesbian Lady Dorothy Wellesley to his last lover, Edith Shackleton Heald, in whose houses he received—as might a visiting parish priest—a reverent welcome. But even after Ellmann’s work, much about Yeats’s life and acquaintance remained obscure, and it seemed as though a biographer would never be found who would investigate and summarize such a massively documented existence. Many potential biographers—whether poet or critic, scholar or historian—withdrew, or fell by the wayside abandoning their contracts, or died. The project seemed doomed until the Anglo-Irish historian R.F. Foster, who had inherited the historian F.S.L. Lyons’s papers toward a biography of Yeats, assumed the intimidating task of assembling, interpreting, putting in order, and annotating the life-events and literary history of a poet so energetic, so contentious, and so confident of Ireland’s cultural potential that the rapid appearance over six years of Foster’s excellent two-volume biography put all Yeatsians in his debt. But Foster’s necessary emphasis on the public life and writings of the poet left the marital life somewhat in the shade. Then, in 2002, there appeared Becoming George: The Life of Mrs. W.B. Yeats, a magisterial biography of George Yeats equal to Foster’s in scholarly depth and wealth of annotation. The author was Ann Saddlemyer, a Synge expert at the University of Toronto (and now the co-general editor of the Cornell edition of Yeats’s poetic manuscripts). From the eight hundred pages of Saddlemyer’s life of George, there arose, resurrectively, the many social worlds of the Yeatses, with rich footnotes identifying the extraordinary set of family members, fellow writers, hangers-on, theater people, eccentrics, politicians, and, not least, “rich women” among whom the Yeatses moved. In the biography Saddlemyer included tantalizing quotations drawn from George’s frequent letters to many correspondents, letters that ratified the biographer’s forcefully presented brief for George’s character, actions, and literary judgment. Now Saddlemyer completes the portrait of George by publishing (at the urging of Michael Yeats and with the permission of John Kelly, the general editor of the Letters of W.B. Yeats, still under way) this subset of marital letters. They constitute a particular genre among Yeats’s letters—less literary than his exchanges with fellow writers, but in every way the most unbuttoned utterances of Yeats the man, whom George knew as no one else could. Yeats was the most hardworking of poets and George the most hardworking of wives, as she eventually became conscripted into every part of her husband’s complicated life—his dealings with family, publishers, writers, accountants, and the Abbey Theatre, as well as his travels, illnesses, and affairs. As his health failed, she took over more and more duties, and after he died she found herself serving as his de facto literary executor for the thirty years of her widowhood. WILLY (AS HE WAS known from youth) and George began the marriage in a stilted way. Although they had been acquainted since 1911, and had moved in the same social circle, and had shared an interest in the occult, the first half-century of the poet’s life had been lived without George. By the time he married in 1917, he was already a “finished man among his enemies” and was supporting his irresponsible old father and his two unmarried sisters (who, as proprietors of the Cuala Press in Dublin, published limited editions of his works). Since his twenties, Willy had been in love with the beautiful political activist Maud Gonne (who had steadfastly refused to marry him, while secretly bearing two illegitimate children to her French lover); after her last refusal, in 1917, he proposed to her daughter Iseult, who also refused him. 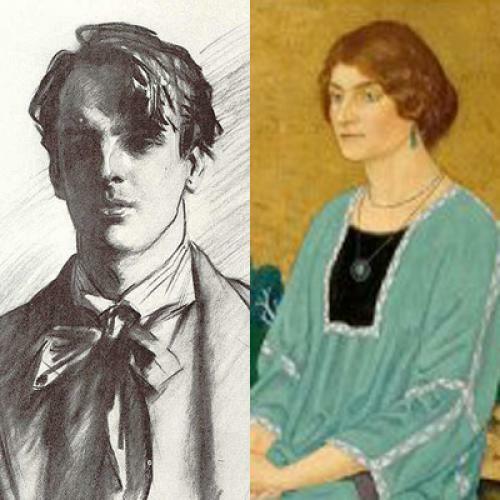 A few years earlier there had been a (false) pregnancy scare from one of Yeats’s previous lovers, Mabel Dickinson, and the poet’s friends, including Olivia Shakespear (his first lover) and his patron Augusta Lady Gregory, were eager for him to find a wife. Olivia Shakespear’s brother Harry had married George’s widowed mother, Nelly, and Olivia Shakespear’s daughter Dorothy would become the wife of Yeats’s friend Ezra Pound, so Yeats was bringing into his life—when he proposed to George and was accepted—someone already approved of by his friends. Pound acidly remarked to a correspondent that George was rich; and early in the marriage George was indeed the one who paid for the restoration of the ruined tower at Ballylee that Yeats took as his personal symbol. (In the longer run, according to Saddlemyer, the partners contributed approximately equal amounts to the household.) But in spite of the persuasive powers of his friends, Willy was still of three minds when he took on a life with George instead of with the romantically preferred Maud or Iseult, both of whom still loomed large in his psyche. Years ago knowing that I had ♂ in my VII I feared your strong magnetism. I know now that the strong magnetism is not a thing to dread but a foundation for lasting love. Did you notice that ♀♂ and ∆ ♄ & ♀ [is] in mutual reception with ♃? astrological symbols for Mars in his seventh house; Venus conjoining Mars and trining Saturn and Venus in mutual reception with Jupiter.... This reading promised a union of good fortune: the Venus Mars conjunction with Venus and Jupiter ... harked back to horoscopes ... when marriage had been discussed earlier that year. Early in this collection, we see occult exotica dominating the first five years of the marriage, as George becomes a medium, goes into trances, has dialogues with “controls,” and, by self-hypnosis, induces “sleeps” in which she speaks aloud lessons from mysterious “Instructors.” After those five early years, the occult sessions are replaced by more practical things. Willy requests that underwear be mailed to him in London or that books be mailed to him in France, or that messages be conveyed to people at the Abbey. George’s responsibility for the two children, Michael and Anne, meant that most of Yeats’s travels in the earlier years were done alone, necessitating frequent communication by mail: the collection includes 436 letters by Willy, 149 by George, and 29 written to their children. The sessions of automatic writing also served George’s own purposes, as the Instructors repeatedly emphasized to the poet the intimate connection between sexual pleasure and imaginative creativity, bestowing on the “geometrical abstractions” of his “System” a sustaining connection to bodily reality, and enabling Yeats’s embrace of coarseness in the service of truth (see “News for the Delphic Oracle”). Since George herself had spent her youth reading omnivorously in both classic authors and occult arcana, she could be regarded by her husband as a worthy partner in learning and practice. In fact, after reading Saddlemyer’s account of George’s literary range and mastery of several foreign languages, and after seeing not only the wit and liveliness of her letters but also her literary confidence in judging various productions at the Abbey, one wonders whether there could have been any woman better suited to accompany Yeats through life. Of course it was only from, out of, or because of, the worst kind of moral cowardice that I telephoned to the police; but there was McCoy, so eloquent,—if this sort of thing was allowed to pass unnoticed ALL the Dustbins on the Square might be stolen.... “There’s a lot of police regulations that are never enforced” says the police at the other end of the telephone “but there’s a regulation that bins shouldn’t be put out as early as that”. “Do you think the police took it” says I. “O no” says he “They wouldn’t take it. They’d notify.” Then “When they [stealers of dustbins] take them they generally empty them out on the pavement, did they empty out yours?” “They did not” says I. This hotel is full of children who keep running up & down stairs & past my door. There are, I think, three families. The worst consists of six so much the same in size & voice that I am certain all six were born at a single birth. They are very good children but intolerable. The pettest old things have erupted into the Abbey—the Lord knows from what suburb or province of Dublin. Ancient white haired, fearfully eighteenth century old things, with diamond stars in their hair, or white lace caps (diamond stars and brooches in them also) and lorgnettes, and faces marvellously made up in the fashion of fifteen years ago, the fashion that wanted to deceive. Such flashes of vivacity are more than matched by Willy’s epigrammatic sentences. After reading Maud Gonne’s autobiography, he comments to George on Maud: “Very much herself always-remarkable intellect at the service of the will, no will at the service of the intellect.” Yeats, so conscious of the quarrels of himself with himself, of Self with Soul, could not imagine living as a single-minded political ideologue—and yet he came to a grudging respect, in “Easter, 1916,” for the way the accidents of history (in this case the decision of the British to execute the Irish rebels) can elevate political hotheads (as he saw them) into national martyrs. AS TIME GOES ON, the letters darken with the onset of Yeats’s many physical setbacks. Sometimes he is merely suffering from indigestion or a bad cold, but increasingly there are signs of serious high blood pressure and heart disease, causing prolonged illnesses, depressions, and prostrations rendering him at times unable to walk. (George pushes him in a wheelchair.) And yet he rallies, announces that he is getting better, or feeling well, or writing again, keeping up the deception until his precarious situation becomes unconcealable, and George rushes from Dublin to Spain or France to take care of him. George is taxed as she needs to handle more and more aspects of their life, from finances to medicines to “theatre business, management of men”—and the family and Abbey affairs needed much managing. The lamp of course consumes lamp oil, paraffin. What in Heaven’s name else could it consume?! Its very form shouts paraffin oil; you could surely not have imagined that it demanded Sanctuary oil, or olive oil? Behind the scenes, as Yeats’s health becomes a constant concern, George watches over Willy’s travels from a distance. Before one of his visits to Dorothy Wellesley, she writes an anxious letter giving his diet and his daily routine, emphasizing the necessity for frequent rest. On another occasion she wrote to his lover Edith Heald explaining the necessity of his daily doses of digitalis. Apprehension is a constant note: “I am glad he can go to England now, because I doubt very much if he will be able to go over again, at any rate unaccompanied.” He was no longer able to spend winters in the cold climate of Ireland, and George (now that the children were old enough to be in boarding school) had to set up housekeeping—or hotel living—in various warmer spots, from Rapallo to Roquebrune (where he died). When he was out of Dublin, Yeats relied on George’s uninhibited reports on the Abbey: in 1938, after the revival of Shaw’s The Shewing-up of Blanco Posnet, George writes that she rode home on the bus “cursing and swearing all the way about noisy productions, noisy to the eye and to the ear, screaming yelling howling shouting gesturing—booo. But I suppose the only alternative is contained in that horrible word ‘restrained.’ Certainly when the stage yells and shouts the audience takes its cue.” “That horrible word ‘restrained’” stands for the English notion of good stage manners; the riots at the Abbey mark the anarchic moments of the Irish spectators. Yeats and George had an equal distaste for both extremes, and their shared literary standards, along with their ready wit, made them true friends. In that case I can send [the cover artist] Sturge Moore the new Byzantium poem (I have it here) which will give him a mass of symbols. “Byzantium” would follow up my old “Sailing to Byzantium” which people liked. To read ... Yeats’s predecessors, in their full and complex contexts, reimagining contemporary preoccupations and implications, cross-referencing them to the realities that surrounded and linked them, can help convey what Yeats absorbed from them.... The bulk of this book is concerned with the traditions of Irish literature that lie behind him, rather than with his own work. And what, as Foster identifies them, were “the traditions of Irish literature that lie behind” Yeats? The jacket copy briefly enumerates the literary traditions traced in Foster’s four chapters. They are: romantic history and fiction; the poetry and polemic of the “Young Ireland” movement; the occult and supernatural novels of Sheridan Le Fanu; and William Carleton’s “peasant fictions,” as well as fairy-lore and folktale collections. As far back as 1989, Foster was publishing arresting reflections on the role of the occult in Irish Protestant culture, and this subject generates the most original chapter in his new book, tracking the Irish sources of Yeats’s interest in magic, secret societies, séances, and the supernatural. “Twenty years ago,” Foster writes, “I suggested some patterns behind the attraction of the occult for Irish Protestant writers,” ascribing that attraction in part to “Protestant insecurity and self-interrogation” in a country where elaborate Catholic and folk supernatural beliefs dominated. Foster’s chapter takes the reader on a rapid ride from stories of the supernatural to Swedenborg to the (adult) Irish fairies, establishing the theme of “a parallel world which can be entered by concentrated mental and spiritual exercise, and whose denizens engage in activities which both mirror and illuminate our own—and affect our destinies.” There exists (profitably for Yeats’s poetry) “the idea of a thinning membrane between the living and the dead.” In Yeats’s “System,” the collective unconscious, Anima Mundi, is separated by a permeable membrane from the minds of the living. Current criticism tends to read the effusive literary productions of this era through theses such as the picaresque, or racial “othering,” or a colonized discourse which can be paralleled elsewhere in the British Empire. It might be more profitable to look at what the Irish Romantics wanted to do, what they thought they were doing, whom they admired, and how they expressed their nationalism, or sense of nationality.... And these texts, written by Protestant Unionists determined to claim an Irish identity, were key influences on the young Yeats. Yeats is too capacious a writer to be circumscribed, whether by his own amusing self-portraits in these day-by-day domestic letters or by any school of literary criticism or historiography. Readers have seen, by now, the stunning extent of his work: poems, anthologies, and editions; letters (not yet edited in full); torrents of prose in memoir, essays, and public statements; and, most recently, the occult notebooks and the manuscript versions of the poems. Interpretation shows no sign of abating. Auden said, in that early elegy, that Yeats had become his admirers. True, but admirers are not enough; we need scholars and critics too. R.F. Foster has made us more strongly aware of Yeats’s inheritances from that Victorian Ireland so brightly and distinctly evoked in Words Alone. And Ann Saddlemyer has displayed George Yeats, in life and letters, as a far more learned, humorous, and expressive presence than we had realized, admirable in her morals, brave (when shooting erupted in Galway and Dublin), solicitous as a (virtually single) mother, and a brisk, honest, and sympathetic friend to her remarkable and erratic husband. Helen Vendler is the A. Kingsley Porter University Professor at Harvard University. This article originally ran in the September 15, 2011, issue of the magazine.